Company did say dry spillway could result when Mississippi flow slows. Officials from Crown Hydro LLC, the company looking to build a hydropower plant at St. Anthony Falls, acknowledged in an informational meeting Tuesday that their project could effectively create a dry spillway during some nights of the year when the flow on the Mississippi River would be minimal. Anita Tabb, commissioner for the Minneapolis Park and Recreation Board, which has fought the hydro proposal for more than a decade, called that a “scary” prospect and was one of dozens of residents and local officials at the meeting who faulted Crown Hydro for not being fully open about the potential impacts of its project. “You’re not making any friends,” she said. Rich Greenlee, an engineer for the project, tried to assure questioners that two tunnels could be built for the plant without undermining the Stone Arch Bridge, and that vibration from construction and eventual operations would be hardly noticeable. However, Richard Savelkoul, an attorney for the project, repeatedly said he had few other details to offer questioners — even the project’s potential cost and Crown Hydro’s financial stability — because the project is being redesigned and its federal license application amended. That left most of the roughly 50 people at the meeting — dubious when they arrived— frustrated and angry. One riverfront resident drew applause when, more than an hour into the meeting, he said, “We should all leave.” But few did. A few praised the attempt for being a renewable energy producer. 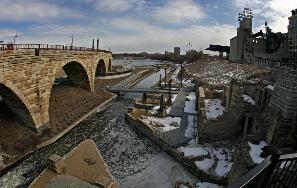 It would sell power to Xcel Energy and be partly financed by a state renewable energy fund. But others pointed out that Xcel and another company produce hydro power at two other sites along the downtown stretch of the river and that water diverted to the Crown Hydro plant would be water that’s not available to other proposed water-related redevelopment projects along the river. Parks officials reiterated that the falls is now a key aesthetic feature in an area where, according to park board president John Erwin, $300 million of public money in recent decades has sparked $1.9 billion in private investment.